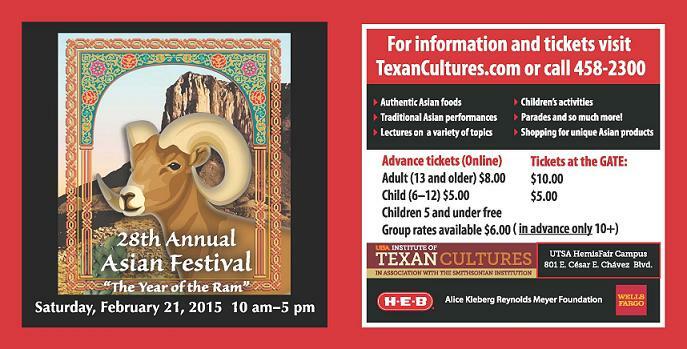 28th Asian Festival February 21, 2015 "Year of the Ram"
Our hats off to our sponsors! 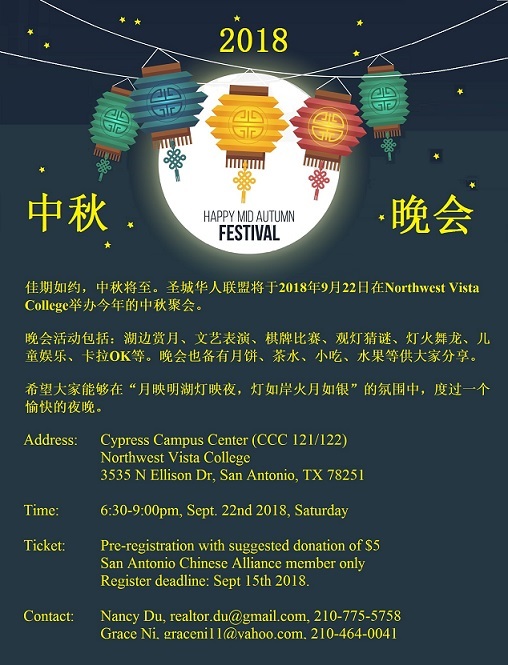 The San Antonio Chinese Alliance (SACA) will host 2018 Autumn Festival Celebration Tea Party at the campus of Northwest Vista College this Saturday September 22. Activities include artistic performances, dragon dance, card game, children’s activities etc. SACA will provide simple refreshments, fruits and moon cakes. 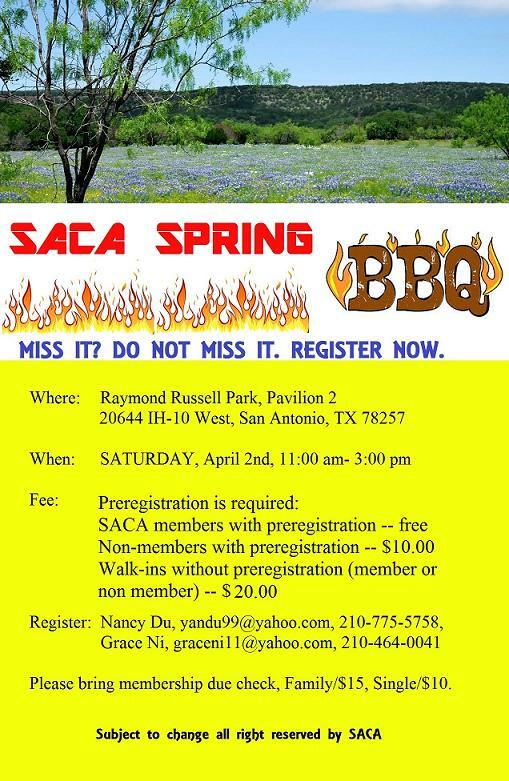 Please see the flyer for details, pre-registration is required for current SACA members. We are looking forward to seeing you in September 22. Ticket: Pre-registration is required with suggested donation of $5. 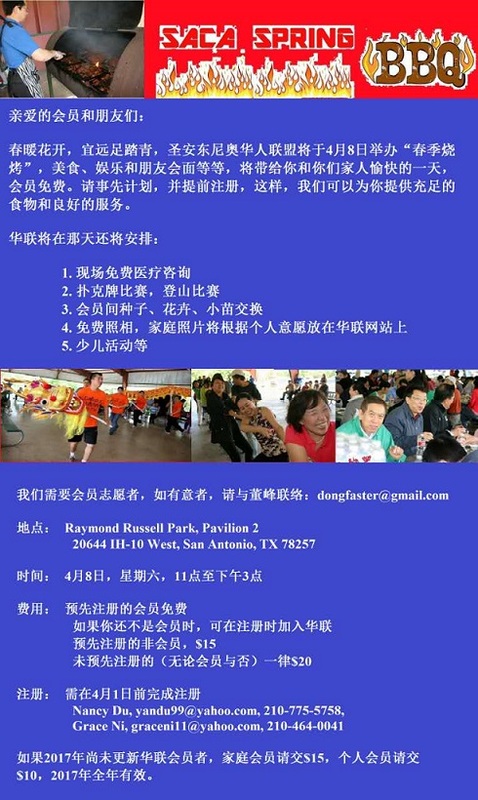 San Antonio Chinese Alliance will host SPRING BBQ on April 14th. You and your family will have a fun time as usual and it is free for SACA current members. There will be great foods, drinks, games and more. You don't want to miss. Please save the date and register in advance so that we can prepare foods and services for you. 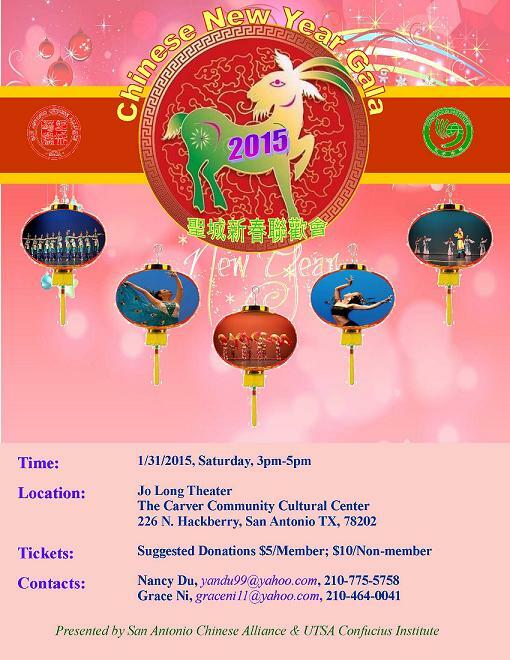 SACA will arrange: Kid activities, debut of SACA female dragon dance group, and tens of lucky draw gifts. You can join in SACA at the time of pre-registration if you are not a member. Register: Pre-registration is required. Register by 4/7/2018. You are welcome to renew or join SACA membership for year of 2018 at this time. Family/$15, Single/$10. It covers of the entire year of 2018. We invite you to the annual Chinese New Year Gala! This year, we will be featuring local talent as well as musicians and performers from other cities. Mark your calendars for this unique cultural event! We look forward to celebrating the Year of the Dog with you and your family. 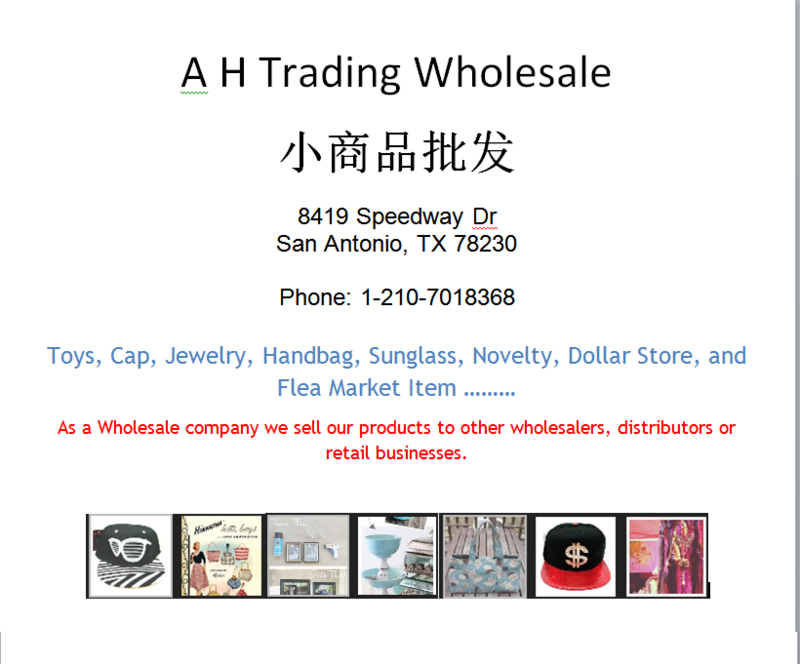 The San Antonio Chinese Alliance is a non-profit organization dedicated to integrating Chinese immigrants into the US; educating the community on Chinese culture, folk arts, and language; and promoting harmony and partnerships within the San Antonio community and beyond. Your sponsorship is welcomed and greatly appreciated! This production is not a presentation of the Carver Community Cultural Center or the Carver Development Board. The Mid-Autumn Festival is coming. This year, the San Antonio Chinese Alliance will host a series of celebrations, including badminton competitions, hiking and Mid-Autumn party. 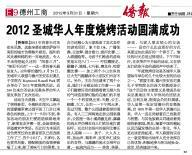 The party will include dinner, snacks and moon cakes, poker competition, performances, lottery and children's games. Your sponsorship are welcomed! Together with SACA we will make our Mid-Autumn Festival better. Registration required & No walk in. Registration: Before Sept. 30th, Member $5 per person, Non-member $15 per person, free under 3 years old. San Antonio Chinese Alliance will host “SPRING BBQ COOK-OFF" on Saturday, April 8. This will be a fun-filled event like every year for you and your family. It is free for SACA current members. There will be great foods, drinks, games and more. Please register in advance so we can prepare the foods and services for you. Fee: Pre-registration is required. Register by 4/1/2017. You can pre-register to join SACA in same time if you are not the current number. Please bring membership check if you have not renewed in 2017. Family/$15, Single/$10. It covers of the entire year of 2017. The San Antonio Asian Festival has grown from a traditional gathering celebrating the Chinese New Year into a huge celebration of all Asian culture. Visitors can enjoy cuisine from authentic Asian-American food vendors representing a variety of countries and tastes, and there are live cultural and musical performances ranging from the traditional to the contemporary. This family-friendly event also features multicultural cooking demonstrations, eclectic artwork, fashion and crafts. The golden breeze is gracing us with comfort. The season of harvest is just around the corner. 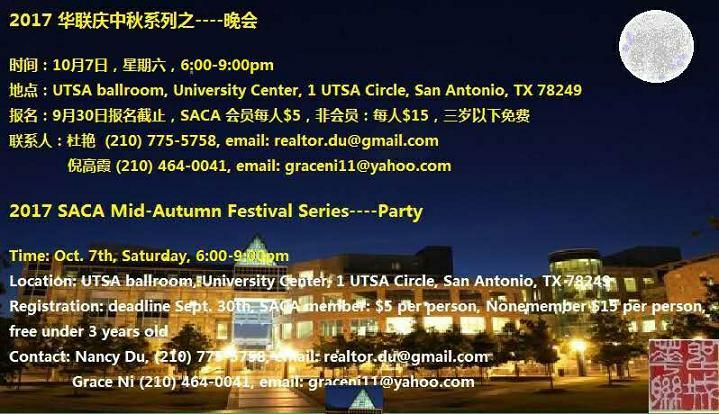 The San Antonio Chinese Alliance (SACA) will host the Greater San Antonio Area 2016 Autumn Festival Celebration Tea Party at a beautiful lake side facility on the campus of Northwest Vista College. Activities include artistic performances, puzzle games with awards, ballroom dances, "Mr. Fang Wealth Management Cup" Tractor card game tournament , children’s activities, etc. SACA will provide simple refreshments, fruits and, of course, the center piece of the party -- moon cakes. Looking forward to seeing everyone joining us at the beautiful campus of NWV College, to celebrate love, friendship, and to enjoy this important festival in Chinese traditional culture with friends and families. Time: September 17th, 2016. 7:00 pm �C 9:30 pm. All tickets must be pre purchased. No ticket for sale at the door. Ticket sales deadline: September 10th. 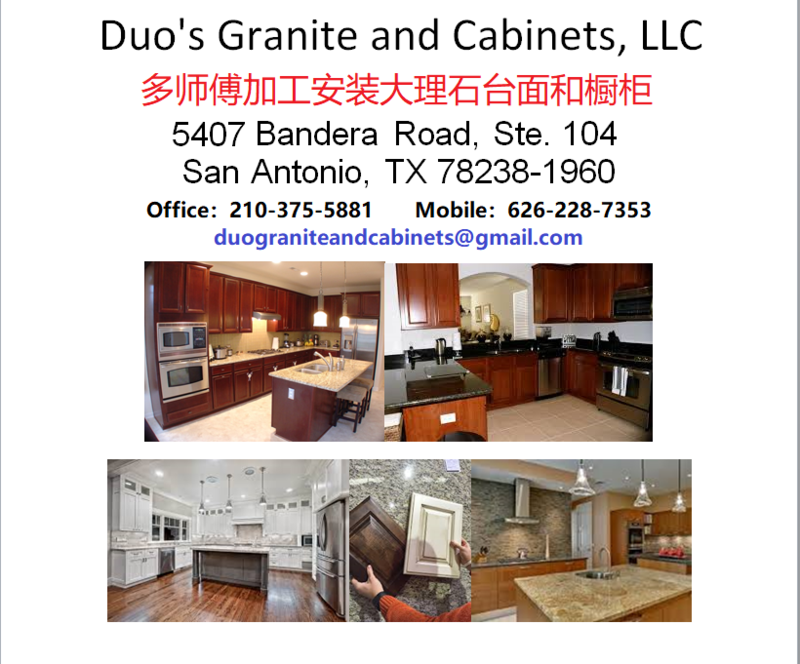 San Antonio Chinese Alliance will host “SPRING BBQ COOK-OFF" on Saturday, April 2nd, from 11:00am to 3:00pm. This will be a fun event for the entire family and is free for SACA current members. There will be great foods as always, drinks, fun games and more that you don't want to miss. Mark your calendar and save the date. Please register in advance so we can prepare the foods and services for you. Fee: Pre-registration is required. Register by 3/25. Please bring membership check if you have not renewed in 2016. Family/$15, Single/$10. It covers of the entire year of 2016. 演出结束后走到路上, 听到一位观众说 "这节目谁不看亏大了", 确实, 准备了十年, 那九月九的酒酿的正浓, 喝到嘴里是满满的淳香. 俺把十年来的演出做了一个剪辑, 为的是让有兴趣的团员了解一下合唱团十年走过的历程, 也算是对合唱团的一个致敬, 因纯属俺个人的编辑, 有不当地方请鉴谅. 另外, 昨晚的演出完整节目, 俺也会陆续整理后上到网上. 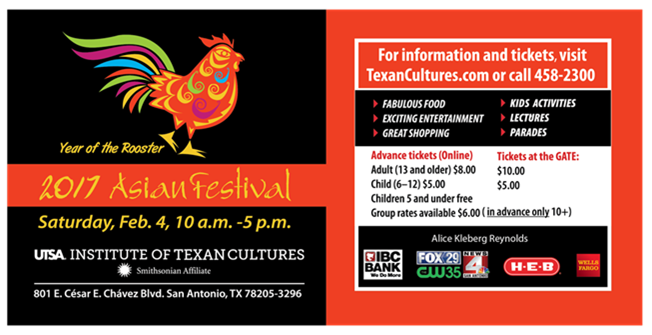 The Institute of Texan Cultures invites Texas and Texans to the Asian Festival. What began as a traditional family reunion for the Chinese New Year has expanded to include other Asian communities and participants, showcasing their unique culture and traditions. Guests can also enjoy traditional Asian dance and musical performances on three separate stages; multicultural demonstrations of cooking, henna painting and palm reading; and craft sales including clothing, artworks, dolls, silk items and other gifts. Please come join us for an informative night! There will be time saved in the program for questions and answers. 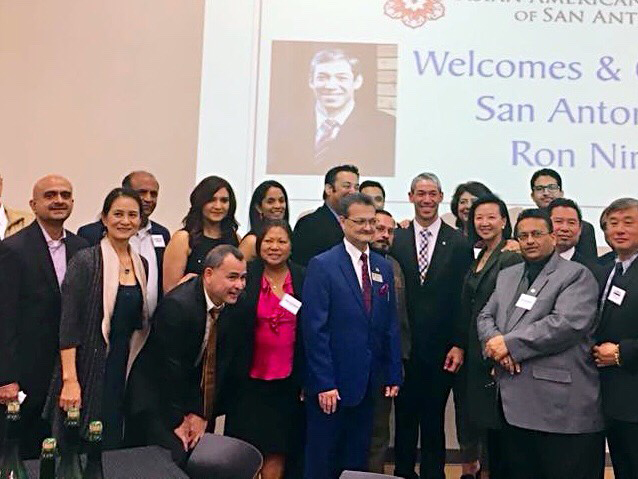 Asian American Alliance of San Antonio (AAASA), a non-partisan, not for profit organization that currently has 17 Asian organizations as its members. 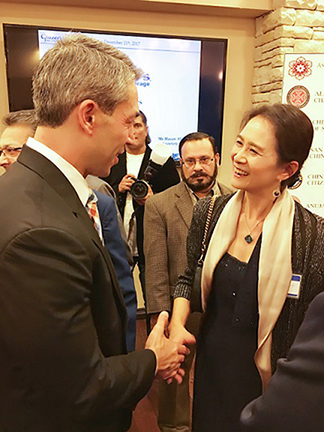 The AAASA’s mission is to promote and unite the Asian community in San Antonio and help our city to be a great place to live, work, and raise families. 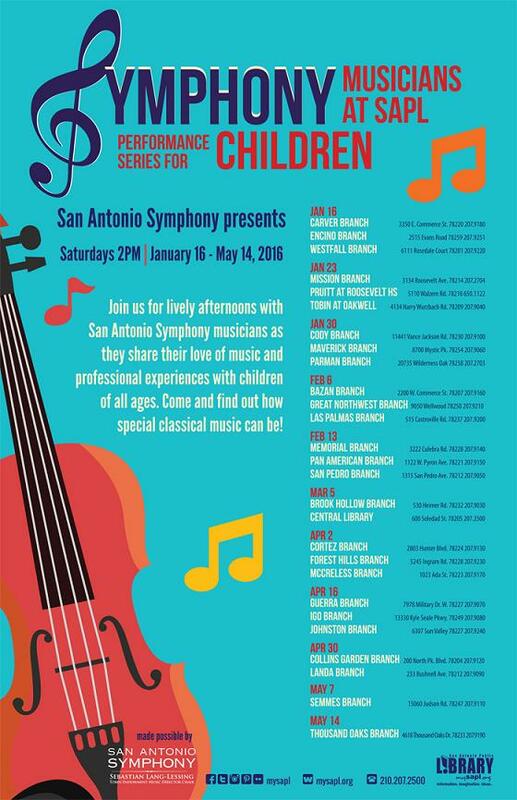 Join members of the San Antonio Symphony this spring at area San Antonio Public Library Branches for FREE presentations to children of all ages on select Saturday afternoons. 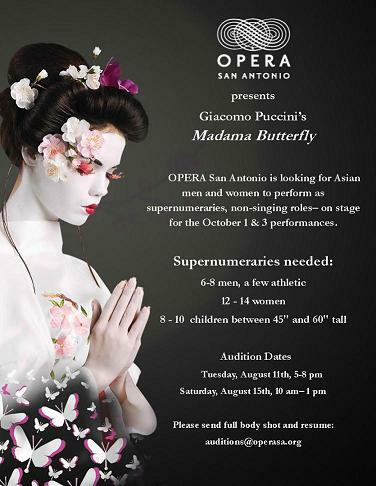 For more information, visit sasymphony.org or call (210) 554-1006. 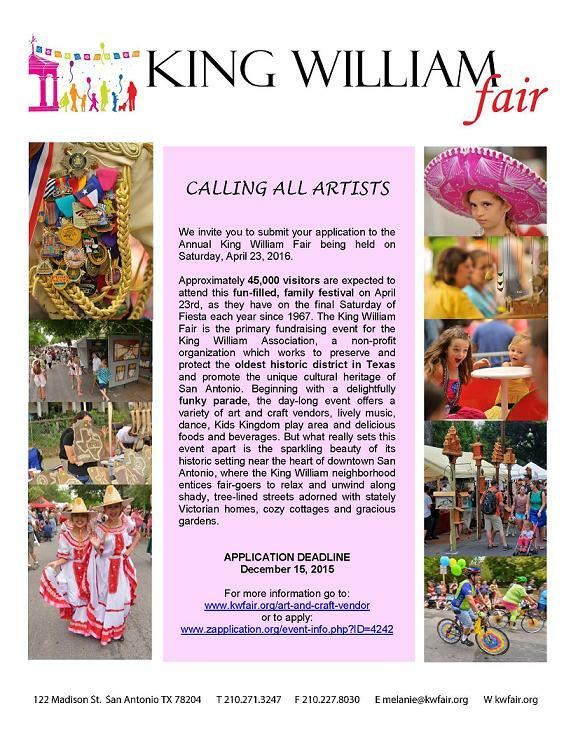 King William Fair is accepting applications for 2016 and the deadline of December 15 is quickly approaching! Let any artist who may be interested in applying know about this opportunity to join in as an arts and crafts vendor for this fun filled, family friendly, Fiesta event. The San Antonio Chinese Alliance and Confucius Institute at UTSA will hold the Moon Festival Celebration Banquet on September 27 Sunday, 5pm-10pm. You and your family are welcome. It looks like that San Antonio may be helping us to celebrate the spring with a rare event -- The forecast has predicted a good possibility of raining tomorrow (4/18). 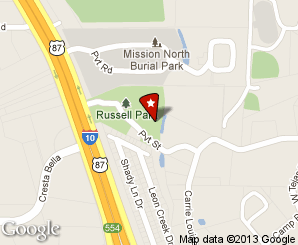 The park pavilion does provide sufficient space to have all major activities under shelter. The SACA Spring BBQ will proceed as planned. Please do dress accordingly and be safe while driving. 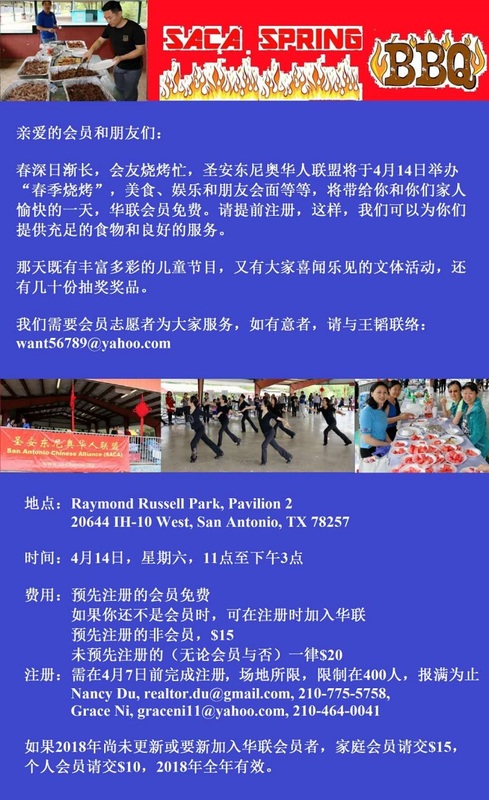 San Antonio Chinese Alliance (SACA) and Confucius Institute at UTSA will host "Spring BBQ and Consulting Services Event" at Raymond Russell Park on Saturday, April 18, 2015, from 11:00am to 4:00pm. This is the fun event for you and your entire family, and is free for SACA current members or CI students if your pre-registration is completed by April 10, 2015 through each of registers below. In addition to the delicious food, fun activities and numerous prizes, we also invited experts to provide consultations free of charge. Confucius Institute at UTSA will provide children's activities. This is the event you don't want to miss. To ensure you are available to attend the event, please mark the event date April 18, 2015 on your calendar and register in advance so we can prepare the BBQ food for you. 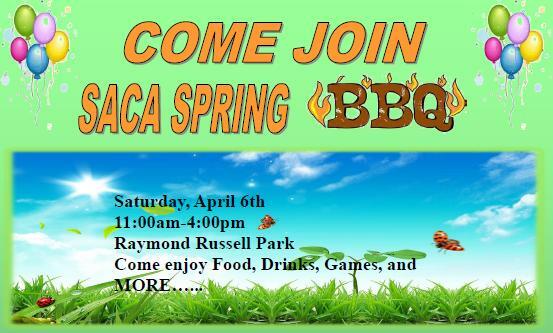 We are looking forward to seeing you and your family in the SPRING BBQ Event on Saturday April 18, 2015 at Raymond Russell Park. Thank you to all of our generous sponsors for your continued support making each year’s event so successful. We will conduct a program screening on further noticed date before the gala. 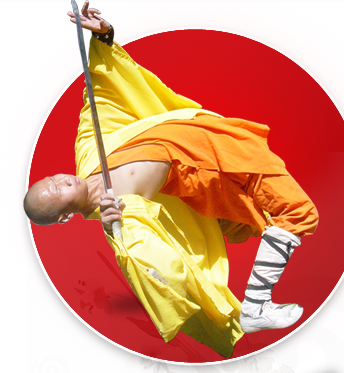 Confucius Institute @UTSA will present The Artistic Group of Northwest Normal University from China on May 4, 2014, Sunday at the Performing Art Center of Northeast Lakeview College. This is a a group of 25 very talented performers from China and will provide a much needed source of entertainment and excellent opportunity to share a rich cultural experience with the community. 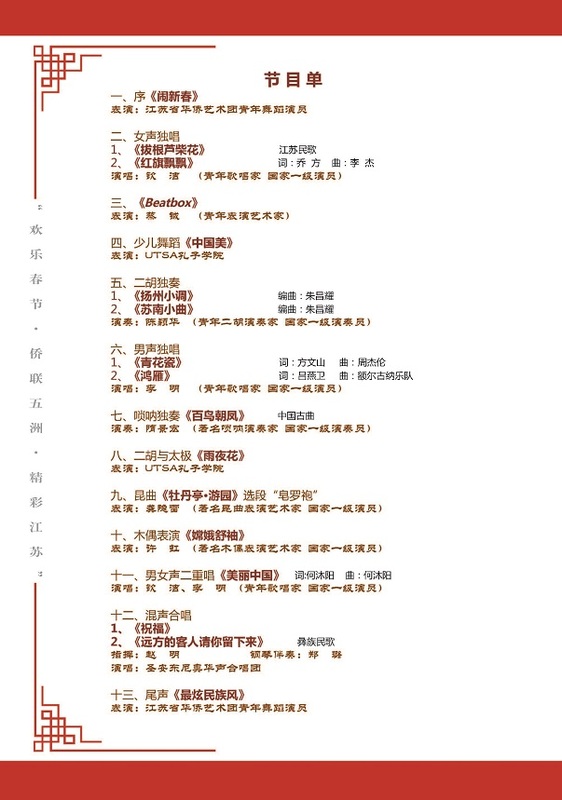 The performances include：舞蹈、竹笛独奏、武术表演、�钅哦雷唷⒚窭趾献唷⒍�胡独奏及书画情景. I am sure that this is the performance you don't want to miss. The admission is free, however ticket is required to attend this performance. We have limited seats. Please reserve your free ticket as early as possible. Please join us for this special performance. We look forward to seeing you and your family at the event. Time: May 4th, 2014, Sunday, 2 pm - 4 pm. For Northeast Lakeview College campus map please visit: www.utsa.edu/Confucius/ or Click here . 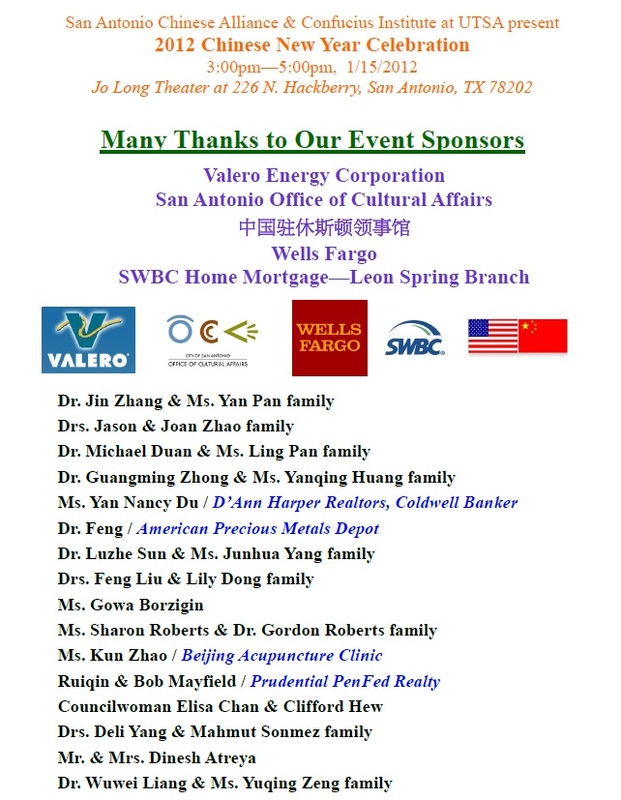 San Antonio Chinese Alliance will host “SPRING BBQ COOK-OFF" on Saturday, April 5th, from 11:00am to 4:00pm. This is a fun event for the entire family and is free for SACA current members. We will have good food, drinks, and fun games and more.....This is the event you don't want to miss. To ensure your participation, mark the calendar and save the day. Please register in advance so we can prepare the food for you. 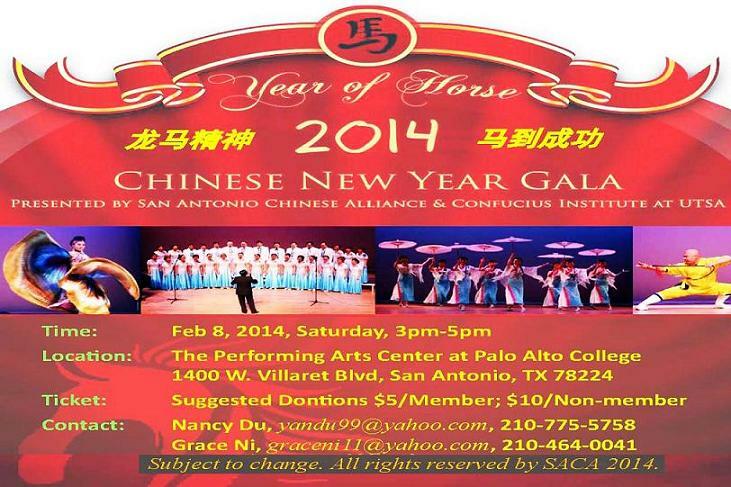 San Antonio Chinese Alliance (SACA) and Confucius Institute at UTSA are joining forces again this year to celebrate the arrival of the Year of the Horse at 3:00 pm on Feb 8, 2014, Saturday at the Performing Arts Center of Palo Alto College. 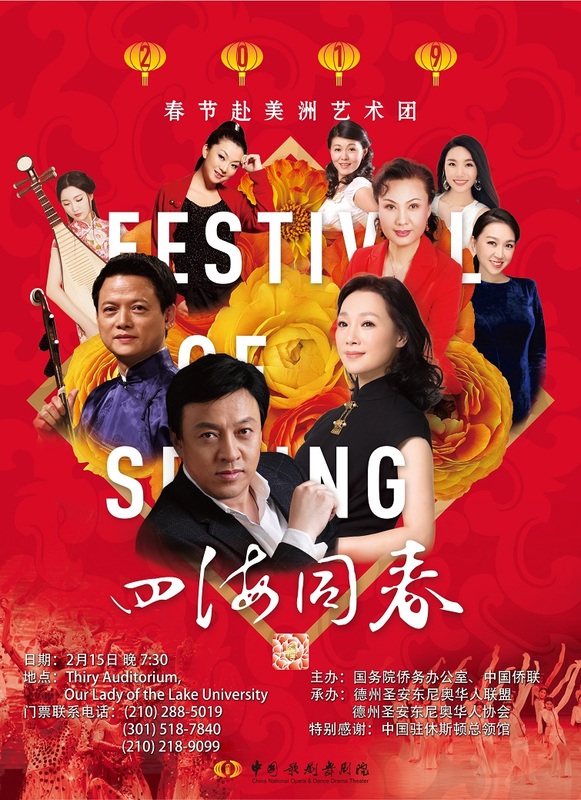 The event promises to be the largest celebration of the spirit of the Chinese Spring Festival in the city in 2014 with Chinese arts, music, folk dance, and solo artists. Please mark your calendar and come to join us for this special event on 2/8/2014. We look forward to seeing you and your families at the event! The year of 2013 is approaching to its end. 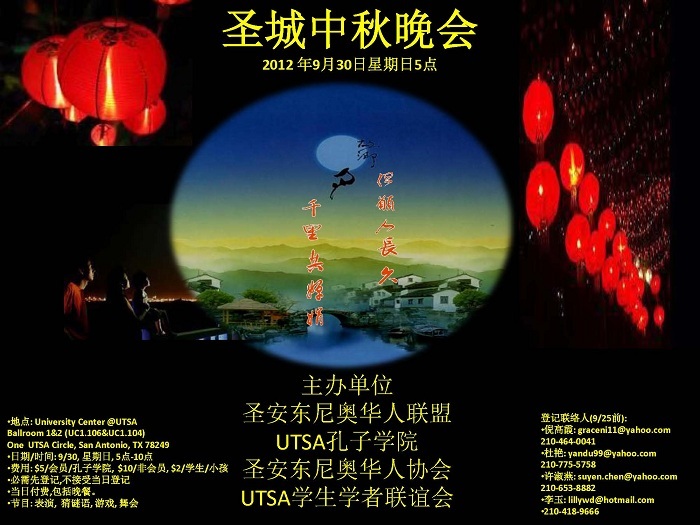 To welcome the arrival of year 2014, San Antonio Chinese Alliance and Confucius Institute @UTSA will co-host 2014 Chinese New Year Gala on February 8, 2014. SACA would like to invite all Chinese friends to unfold your exquisite talent and skills to celebrate this traditional holiday. The format of the performance is flexible, but in squaring polarity. 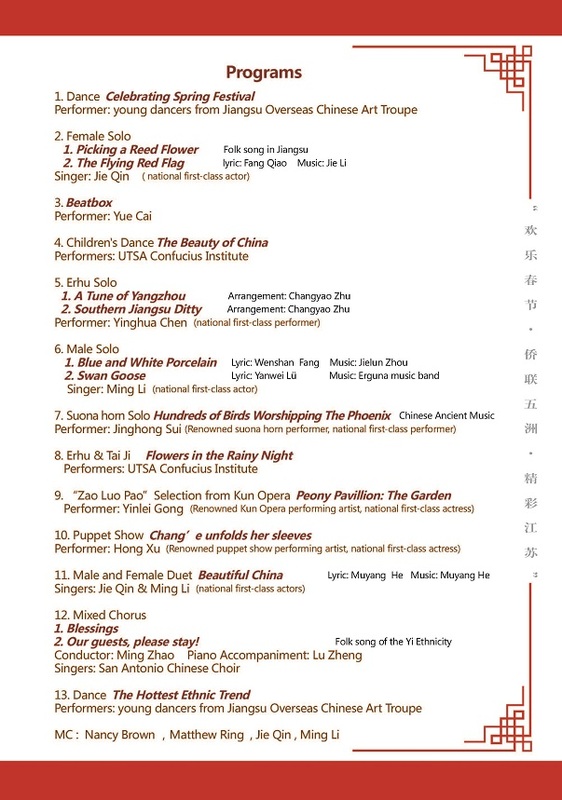 If you are interested in joining the performance, Please submit the program to Zhao Ming: zhaom@rocketmail.com. we will conduct program screening before February 8, 2014. Thank you for your participation. 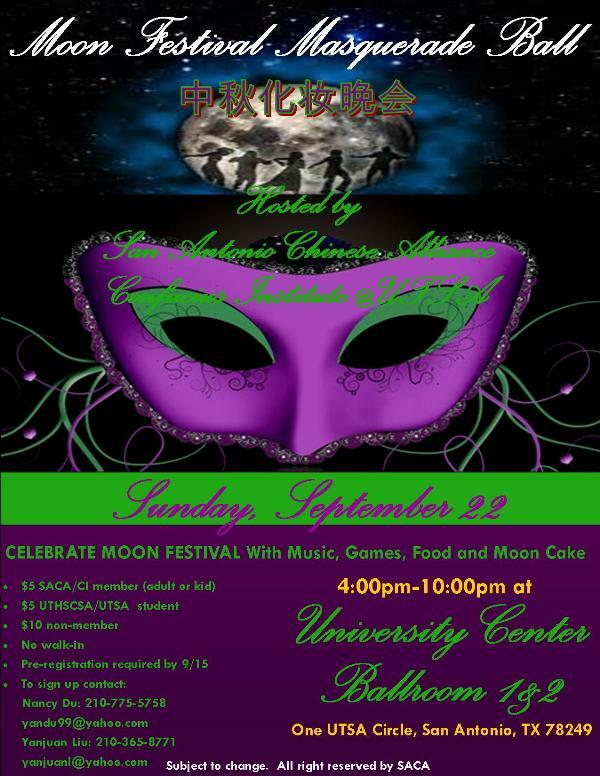 SACA is pleased to announce its Mid-Autumn Festival Masquerade Ball from 4 pm to 10 pm on Sunday, September 22, 2013 at Ballroom 1&2, University Center, UTSA. The Mid-Autumn Festival celebration is one of the favorite events hosted by SACA annually. This year, SACA will empower to co-host with Confucius Institute @UTSA. To make this unique day even more fun and enjoyable, SACA will add masquerade ball in the celebration. You are encouraged, but not required, to dress up and show the world your hidden prince, princess, pirate or fairy. Dress to impress and enjoy great music, fine food, games, dance and friends. Mask and metallic bead necklace will be provided free of charge at check-in. The quantity is limited and is on first-come-first-serve basis. To ensure your beautiful mask and sparkling bead necklace, you must come early. SACA, along with Confucius Institute will keep you and your family moving while you join the fun and get into the mood to mingle. The ticket is $5 per person (adult or child) for SACA or CI member and UTSA/UTHSCSA student. Pre-registration is required and no walk-in. Face book sign up cannot substitute for required registration. Please contact Ms. Nancy Du or Ms. Yanjuan Liu to register. This way we can control our guest flow and make sure all our guests have their dinner reserved. The ticket price includes: dinner, games, and dance party. We look forward to seeing you for a wonderful night together at the Masquerade Ball! Pre-registration by 9/15 is required. Please email zhaorong.ma@utsa.edu to register if you are interested. Please let us know your 1st, 2nd , 3rd, 4th, and 5th choice. SACA 2013 3rd event is coming up on Saturday, May 4th, in UTSA Ballroom 1 @1 pm. 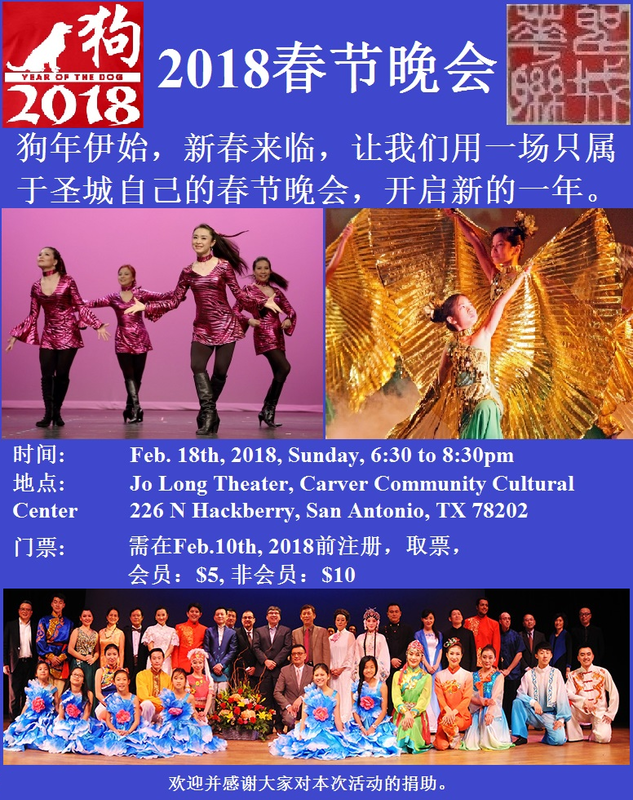 To promote and enrich cultural life, San Antonio Chinese Alliance, Confucius Institute @UTSA, and Austin Chinese Culture Association join together to present "KARAOKE BE-A-STAR". This event serves as a platform for sharing singing techniques and funs in a friendly atmosphere. Professional review and consultation may be provided to enhance your signing skills but it is optional. 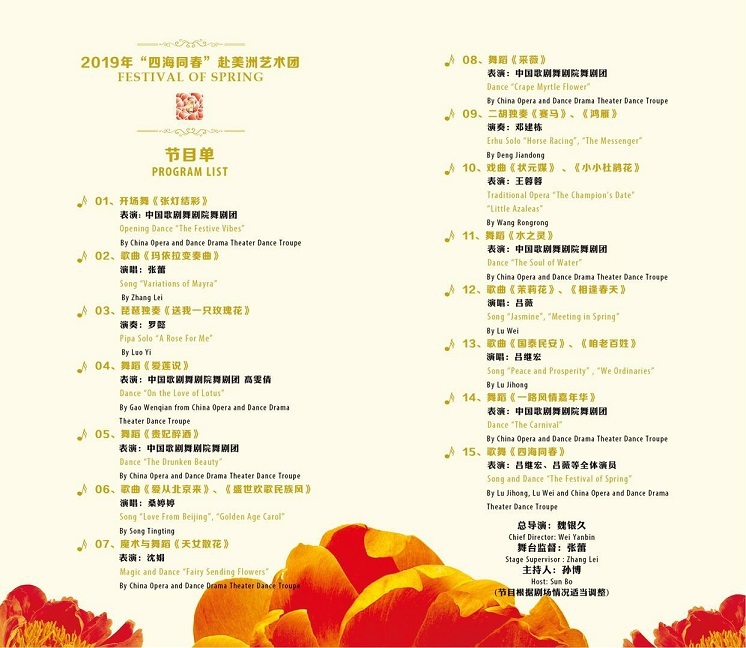 All types of songs, Chinese or English, are welcome. This is not a competition. We are going to have entertainment, snacks, prizes and fun for all of you. Everyone is invited. Join SACA for the music of fun!!! Come, show off your KTV skills, and hang out with SACA families and friends!! Subject to change. All right reserved by SACA. 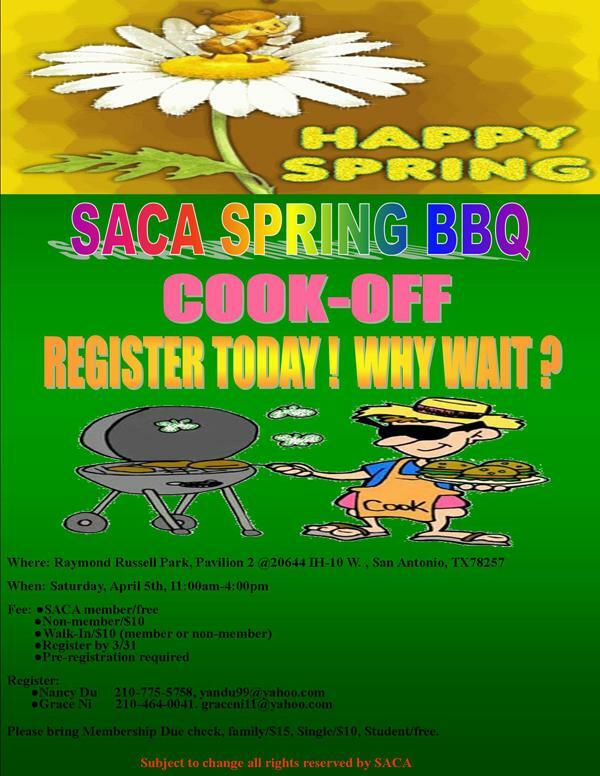 Perfect weather is finally here.....To welcome the year of 2013, San Antonio Chinese Alliance will be hosting a "SPRING BBQ" to SACA members and non-members on Saturday, April 6th, from 11:00am to 4:00pm. This is a fun event for the entire family and is free for SACA current members. We will have good food, drinks, fun games and more.....And the Board will serve up some of grilling. This is the event you don't want to miss. To ensure your participation, mark the calendar and save the day. Please register in advance so we can prepare the food for you. We need volunteers to help out in this event. If you are interested, please contact Grace Ni @210-464-0041 or graceni11@yahoo.com. Please bring membership due check, Family/$15, Single/$10, Student/free. Chinese New Year Gala is only one week away. To celebrate the most important traditional holiday of the year, SACA prepares a splendid program to share with all of you. The program includes many versatile talented people from all over the city. In addition, we are delighted to introduce Shoaling Kung Fu Master Yu Chao Sun & Face-Changing in Sichuan Opera to join our program. Shoaling Master Yu Chao Sun was born in Henna, China. He was practicing martial art in his home town since was 4-years old. He was sent to Shoaling Temple to learn Shoaling Kung Fu when he was 10-years old. 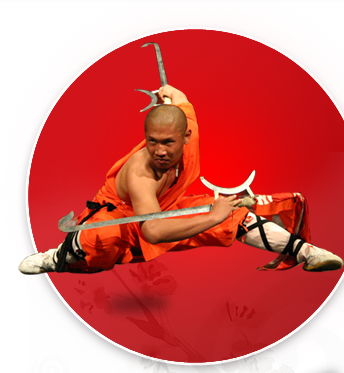 He has been practicing Shoaling Kung Fu for more than 20 years. 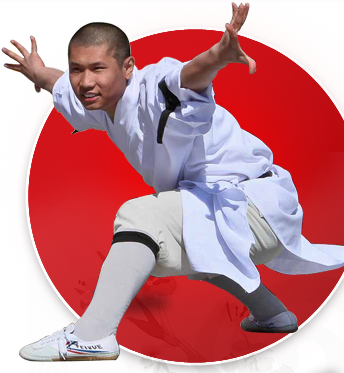 In 2006 , Master Sun came to US for competition, cultural exchange, and has done many performance all over the US and Europe. 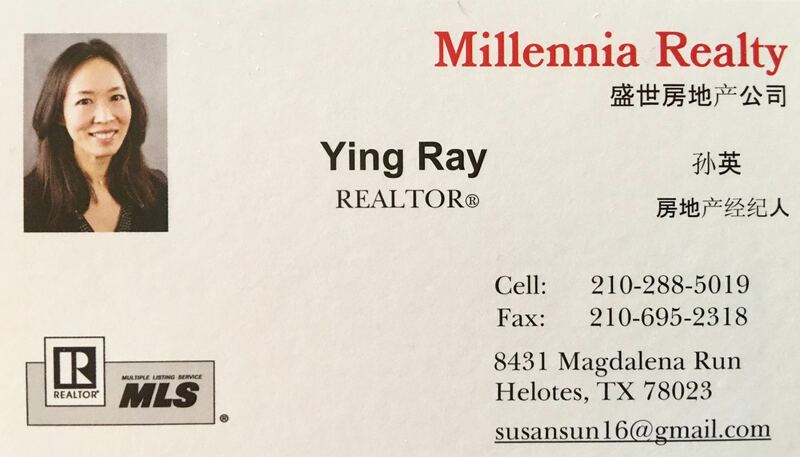 Master Sun currently teaches Shoaling Kung Fu in Houston and Confucius Institute. 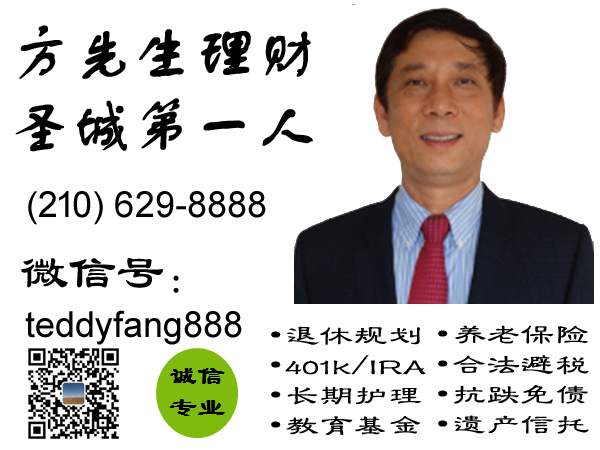 His students have won many 1st, 2nd, and 3rd place metals in the "Long Start" Chinese Martial Arts Championship held in United States. The seats are limited and will be sold out soon. Please reserve your tickets as early as possible. While the leaves are falling and the lawn is turning brown, we know the year of 2012 is slipping away and slowly enters the last act. Quickly, we will greet the new year 2013 and then the Chinese New Year, the year of Snake. Chinese New Year is one of the most important festivals in Asian culture. It is a time for family reunion and scrumptious fests. Also, it represents the beautiful zest of human life. Thus, it is the tradition to reconcile, forget all the grudges and sincerely wish peace and happiness for everyone. To celebrate this wonderful holiday, SACA prepares a splendid program just for you. Many versatile talented people from the city have joined together to share this evening with you. It will leave behind a happy night to you. We wish you a happy and prosperous Chinese New Year in the year of Snake. Date/Time: Sunday, February 3rd, 2013 @3 pm. While you may still have a vivid memory of 2012 Chinese New Year Gala, the year of 2012 is getting closer to its end and 2013 will arrive soon. 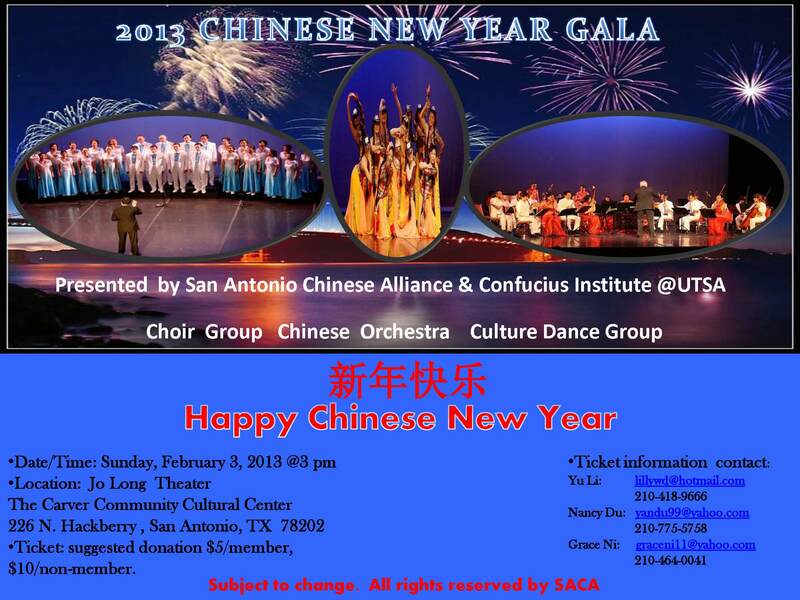 San Antonio Chinese Alliance will host 2013 annual grand Chinese New Year Gala on February 3, 2013. SACA would like to invite all Chinese friends to unfold your exquisite talent and skills to joyfully celebrate this traditional Chinese holiday altogether. The format of the performance is flexible, but in squaring polarity. Any interested person please submits the program to Zhao Ming, email address: zhaom@rocketmail.com, for considerations. We will conduct program screening sometime in January, 2013. 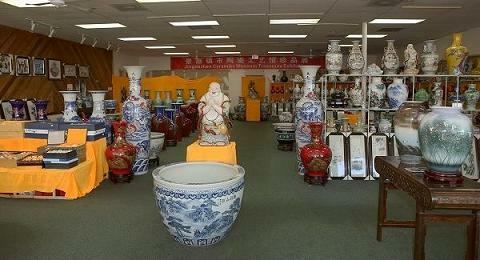 Mid-Autumn Festival, also known as Moon Festival, is a popular festival celebrated by Chinese. Celebration of the Mid-Autumn Festival has a history of over 3,000 years and is traditionally held on the fifteenth day of the eighth lunisolar month, which is in September or October. On this day, Chinese family members gather to appreciate the bright full moon, eat moon cakes at night, express strong yearnings toward their homes and think of family members who live far away. 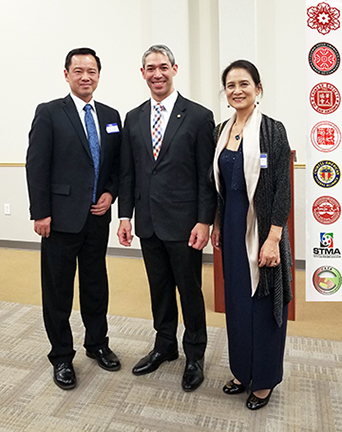 For the first time, San Antonio Chinese Alliance, Confucius Institute at UTSA, Chinese Society of San Antonio, and UTSA Chinese Student/Scholar Association join together to host this year's Mid-Autumn Festival event. Many activities are arranged especially for you. This is a fun event I am sure you will enjoy. Pay on site: dinner, moon cake included (adult only). The deadline for registration is 9/25. Seats are limited. Confucius Institute at UTSA will organize a summer trip to China in July if there are enough enrollments. There are three summer camps in July, minimum 10 students are required for each summer camp. All these three summer camps are sponsored by Office Oversea Chinese Affairs and target at oversea Chinese Heritage students. The summer camp expenses in China will be covered by the event sponsor. International airfare will be at participant’s own expense. Don’t miss out this great opportunity and act fast! Mrs. Mary Chen graduated from Chongqing Nomal University (Si Chuan) and Shenzhen University (Guang Dong). She studied ancient Chinese dances and choreography from Professor Beibei Zhang at Beijing Dance Academy for many years,. Later she studied Bian Lian ( Face-Change) in Sichuan opera. She has performed in Hong Kong and Singapore. She has combined dancing and masks changing in an innovative way. She had won numerous awards for specialties in Tai chi, Tai chi fan, sword, Face change, and Latin dance. People in real life, cartoon characters, and even abstract objects can become to the subjects of her mask changing. In addition, she has incorporated the performance of Tai Chi sword to royal dances. She performed and worked in Shanghai. Shenzheng, Hangzhou, Chongqing of China. She has performed Bian Lian in New York, Houston, Dallas, and the Rio Grande Valley. She was honored to perform on stage in the same event with some famous Chinese stars, such as 江昆，田震，任答华，满文军，庞龙等 in Houston, etc. cities. Mary has performed four times this year in the Community center of McAllen. Her performance was highly valued and appreciated by the audience and organizers of the city of McAllen. Face changing is a stunt of performance in opera arts and is a romantic technique to reveal the innermost feelings of characters in the play. According to the legend, the ancients painted different patterns on their faces to scare away fierce beasts for survival, thus the "face changing art". Sichuan Opera uses "face changing technique" on the stage and transforms it into a special art with stunning skills. "Face changing technique" was firstly used for characters like gods and spirits as early as in the Ming Dynasty. "Changing into blue face" was already recorded in Erlang of Guankou Killed the Scaly Dragon, a compound opera of Ming Dynasty. At that time, the actor entered into the backstage to change the face. Later on, it evolved to that the actor changed his face on the stage. It became a stunt. Not a few local operas have it, but it is most famous in Sichuan Opera. Face changing art could be divided to "major" and "minor". In the major "face changing", the entire face was changed by three, five or even nine types. In the minor "face changing", only part of the face was changed. The technique of "face changing" is roughly divided into three types: "smearing", "blowing" and "pulling". There is another way of "Qi-manipulation". When Peng Sihong, a deceased famous actor in Sichuan Opera, played the part of Zhuge Liang in Empty Fort Strategy, he could manipulate "Qi" to change his face from red to white and from white to blue when the servant reported that Sima Yi had withdrawn his army, signaling the fear of Zhuge Liang after releasing the burden.